Raja ji tiger reserve safari & stay, chilla range haridwar-rishikesh(Uttarakhand) Explore the Wild Heritage of Rajaji Tiger Reserve Duration 1 N/ 2D Package cost: Rs 15,999/- Per Person Incl of GST 6 PAX required for this tour package. Sprawling over Pauri Garhwal, Dehradun & Saharanpur; Rajaji National Park- the second tiger reserve in Uttarakhand, is a major attraction for wildlife enthusiasts. Rajaji National Park is a very famous tourist destination located in the India state of Uttarakhand near Haridwar & Rishikesh. * Welcome drink on arrival at luxurious resort surrounded by reserve forest with extremely hospitable staff. * Lunch of your choice Veg/Non Veg. 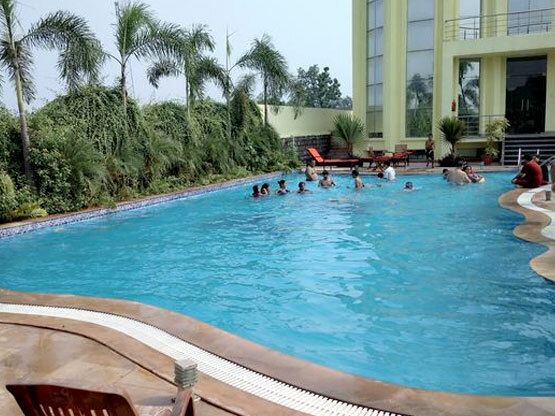 * Enjoy afternoon in the comfort of resort and coolness of fresh water swimming pool. * To Rajaji Tiger Reserve, Chilla Gate for Jungle Safari in Open Jeep. * Tea/coffee snacks to be served. * Music & Dance in A/c hall. * Veg/Non veg dinner & overnight stay at the resort. * Tea/coffee cookies early morning. * Mountain terrain biking & nature walk on the outskirts of restricted forest.